Three series into Marvel’s Netflix Defenders mosaic, there’s a certain elegance to the order in which we meet the four core heroes. Daredevil set the tone with a more recognizable costumed vigilante origin, while Jessica Jones swung the opposite direction with a character practically defined by obscurity, simultaneously laying track for Luke Cage. In a way, Luke Cage brings together the best of both approaches, to begin with the familiar archetype of a hero who most wants to be left alone, but soon sees the value of taking proactive action for the community. It’s been several months since Luke left Jessica Jones and Hell’s Kitchen behind for Harlem’s greener pastures (the timeline of these series is still somewhat unclear), as the future Power Man literally keeps his head down sweeping hair in a barber shop. Like the best of Marvel heroes, Luke still has trouble shouldering the burdens of making rent without raising anyone’s suspicions. It isn’t until a chance intersection with Misty Knight (Simone Missick) and the young men frequenting Pop’s Barber Shop that Luke is forced to step into the limelight and risk exposure of his most guarded secrets. It’s dynamite. It’s a soulful hip-hop western blend of Hercules and ‘The Wire,’ with a breakout cast. 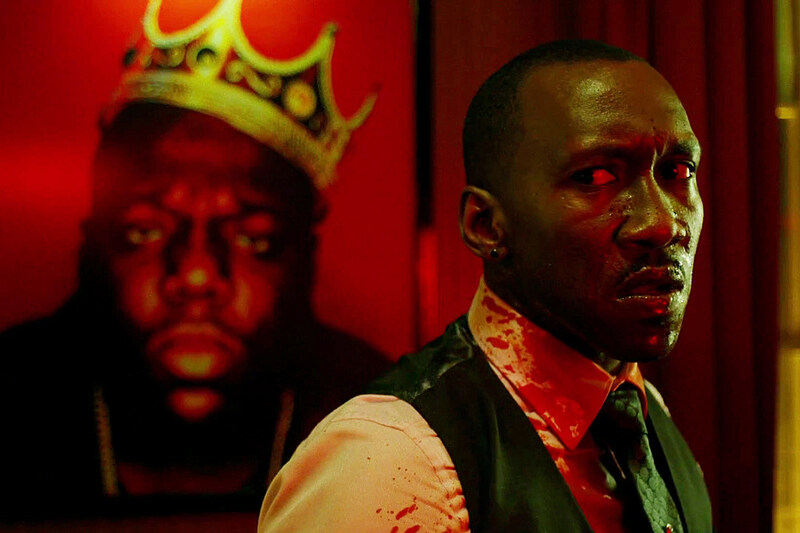 On the surface, that description could be tethered to any number of superhero stories, but the very first scene of Marvel’s Luke Cage brings with it a burst of culture and specificity that really makes the series sing. Customers rib one another in a barber shop mentality, while other interjections across the seven episodes presented to critics cover everything from the debate between Bruce Lee and Jet Li, to Luke and Pop’s favorite authors, all punctuated by soundtrack that feels genuine, and lived-in. Apart from the myriad club cameos and extended musical performances, there’s a dynamism to certain scenes and transitions borne of the character’s own Blaxploitation roots; stylistic flourishes and music cues unlike any superhero story before. Race of course forms a central component of both Luke Cage and the series’ identity, and it’s thrilling to have black voices in the writing who don’t hesitate to explore deeper issues. Cage bristles at another character diminishing him with the N-word, and invokes heroes like Crispus Attucks with a gun in his face. Creator Cheo Hodari Coker famously said at Comic-Con that “the world is ready for a bulletproof black man,” and yet still finds ways to exploit the character’s spiritual vulnerability. The action in Luke Cage isn’t often about whether Luke will sustain any damage; he won’t, but each heroic deed ripples through and jeopardizes his relationship to the community. All the while, the looming specter of his fugitive past threatens to catch up with him. Community represents the best of what Luke Cage has to offer; that characters like Misty Knight, Mahershala Ali’s Cornell “Cottonmouth” Stokes and Alfre Woodard’s Mariah Dillard all contribute the kind of lived-in history that Daredevil never managed for Hell’s Kitchen. The people of Harlem come to know Luke Cage, and it’s refreshing that one of the greatest standoffs the character faces isn’t a test of who punches harder, but rather who can inspire and sway a tight-knit Harlem congregation to their vision of the future. At the center of that controversial new vision is Cottonmouth and Mariah Dillard, both of whom continue Netflix’s streak of upending Marvel movie villains, and each have their own perspective of the racial politics they want to define Harlem. Ali’s practically an old pro at towering over every scene, flourished by a toothy, monotone laugh that feels like the best of 8-bit villain soundbites, and woven with a conflicted black masculinity at odds with Cage’s. Woodard’s Mariah feels more subdued by design, but it’s the history between she and her cousin that injects significantly more depth and humanity that Kingpin or Kilgrave ever got. Woodard’s ferocity will sneak up on you, to say nothing of a third villain waiting in the wings. 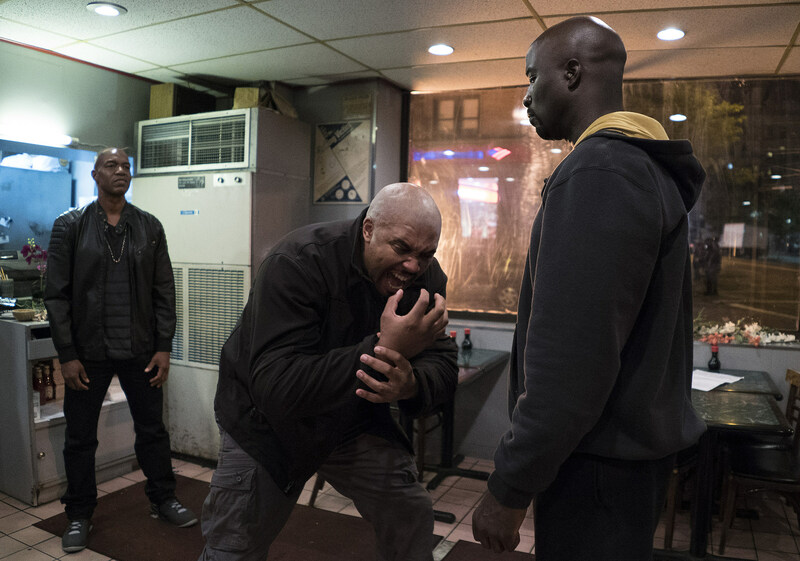 I only wish that Luke Cage might have leaned more into the style and specificity that best define it, as some of the posturing between rival gangs and scenes of Cage effortlessly tossing thugs aside feel a bit repetitive with some of the action we’ve seen in prior Netflix series. Cage is at its best when the title character serves more as a legendary figure, someone who needs only show up to send thugs running, rather than anguish over some of the same self-doubts that come to plague every tortured hero time and again. The short answer– it’s dynamite. It’s a soulful hip-hop western blend of Hercules and The Wire, with a breakout cast, and enough style, surprises and strong action to paper over a few of its more repetitive beats. Speaking of The Wire, be on the lookout for at least two more major stars from the famed HBO drama, apart from Frankie Faison’s Pop. It doesn’t matter if you sweep up hair for a living, if you look like Mike Colter, you will never need to flirt again. I’ll elaborate about the series’ continued tendency to stick with boilerplate Marvel movie references in an upcoming piece, but there’s a tangible connection to the films that fans have been anticipating since the days of Marvel One-Shots. There is … significantly more skin than either of the past Netflix series got away with. You’ll definitely learn more of Luke Cage’s origins, but a few scenes work overtime to shoehorn in the exact setup of his new identity. Marvel is not improving its track record of sacrificing older, mentor-type characters. I have to admit, it didn’t occur to me that Luke and Claire barely met the first time around. She gets a fantastic reintroduction, however. Luke Cage tossing bad guys like ragdolls is great, but best of all are the more inventive uses of his powers, like leaping from tall buildings, or making unexpected escape routes. There’s something very cool about having three major police figures in one case, and all of them black women. Marvel’s Luke Cage will debut all 13 episodes for streaming on Netflix on Friday, September 30 at 12:00 A.M. PST / 3:00 A.M. EST.